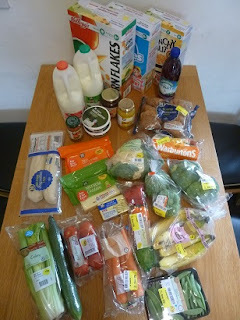 Our third week of eating down the food in our cupboards, fridge and freezer contained culinary high points as well as low moments, much socialising (for us), limited food waste, and a lot more food shopping than originally intended. I’ve listed the meals we ate in my previous post. Culinary highlights were the red lentil and bacon soup, which I have every intention of repeating, and the roast pork which worked out really well and has provided several subsequent meals. Using the extra mince mixture from lasagne to make cheesy topped cottage pie created fine comfort food from a long-forgotten box in the freezer, and I enjoyed the coleslaw even if the children didn’t. of using up store cupboard ingredients, but really I reckon the “meat”balls needed deep frying in half a truck load of oil to make them properly crispy rather than softly disappointing. I also tried making cauliflower and broccoli cheese in advance, resulting in overcooked veg, so I’ll need to tweak the timings in future. We were invited out for a couple of evenings, which was great, but meant a couple of meals I’d planned didn’t happen. Unfortunately half a red chilli pepper and the inside of the coconut went mouldy before I’d had the chance to use them – at least the waste was limited to 43p. Wow. On a store cupboard challenge where I’m meant to be eating up the food in the house, and limiting money spent, I really blew the budget this week. Specific events: a cooked breakfast on Fathers Day, and inviting a couple of families over for a barbecue, then buying different food when the weather forecast was rubbish. Taking advantage of a cereal offer of 3 packs of Kellogg’s cereal for a fiver, so we also got vouchers for two free tickets to Legoland at some point in the next year. Ingredients to fill gaps in planned recipes, like mozzarella for movie night pizzas, or hot dog sausages for mini toad in the hole. 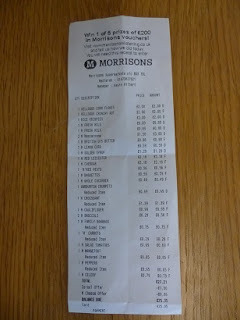 The grand total came to £70.21 in cold hard cash, and £3 from a Co-op voucher. So in week 3 I ended up spending more than six times as much in cash as the week before, plus only a tenth of the vouchers. Painful. Although none of the food will be wasted, I’ve ended up with more food in the freezer at the end of the week then the start, quite the opposite of my intentions for the store cupboard challenge! 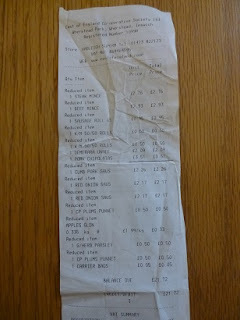 Total value: £171.10, of which £62.34 has yet to be eaten. So after three weeks on the storecupboard challenge, more than a third of the supposedly essential top-up food has yet to be eaten. I really should be able to batten down the hatches and spend less next week! On the bright side, over the first few months of this year my food bills were running at £67 a week for a family of four. During the challenge, I’ve spent £44 a week – down by a third. What other ways do you recommend for cutting your food spending?